The famed French existentialist Jean-Paul Sartre once wrote, "Hell is other people." And there is no place where this rings more true than at America's coffee shops. It's not their living room or office, but they sure do treat it like one. No one knows this more than the people working there. We spoke to baristas and coffee shop owners across America to talk about how to not look like an idiot in a coffee shop. We hope that if you're doing any of these moronic things in a coffee shop, you quit it right after you finish reading this. If you don't do any of these things, we thank you and hope you enjoy your macchiato. You would never sit down in a restaurant for lunch and stay there until dinner, would you? OK sure, it's fine if you're at an all-you-can-eat buffet and you're trying to get your money's worth. But it's not cool to camp in a coffee shop. "If you're taking up square footage in a cafe with limited seating, you're potentially driving away a customer that would be spending money," says Carl, an anonymous owner of a trendy coffee shop. That's not his real name, but don't tell anyone. "Two people might want to come in and have cake, coffee, and a conversation. But they might be stopped by someone sitting at a laptop for three hours sipping a cup of tea." If you want your favorite coffee shop to survive, don't be that person. Or if you must sit there and work all day, buy food or drinks more often. Remember: You aren't entitled to free Wi-Fi, you adorable tea-drinking freeloader, you! Instead of ordering a triple-shot, extra-whip, half-caf Caramel Frappuccino from a coffee shop that does not have a green lady mascot in it, try talking to the barista and telling them you want a cold and sweet java. They might surprise you with a similar drink you've never had and might like, such as a cold brew with house-made vanilla syrup! And keep in mind that coffee is often different at Starbucks than it is at a third-wave shop -- even if it has the same name. A popular Starbucks macchiato comes in a Big Gulp-sized cup. 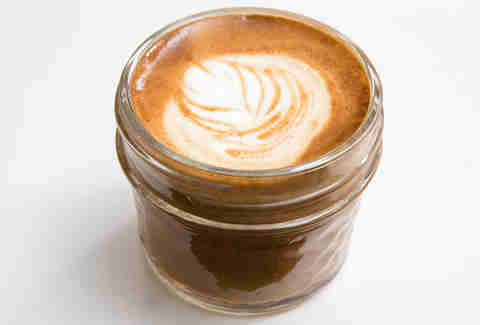 But any shop serious about coffee will serve that same drink in a 7.5oz glass with a mark of milk. It's not your fault for being confused, Starbucks just has its own language. Matt Cronin, who's now a roaster at New Orleans' Mojo Coffee Roasters, was a barista for more than a decade. And he's been asked for everything under the sun, including a demand that he pour coffee into enormous cups many, many, many times. "We have certain sizing limitations on specific drinks -- lattes and cappuccinos are prescribed sizes because we have the ratios dialed in for the overall drink quality," he says. "So it's frustrating when someone accustomed to being able to order a 20oz cappuccino comes in and asks for it." He says he always wants to be accommodating, but not at the expense of pouring you hot garbage. The baristas gets it, you need to go to work. But if you're ordering a specialty drink like a pour-over coffee, it takes time. That's because the barista has to complete an involved process before the java is ready: measuring and grinding the coffee, prepping the filter, and then carefully pouring the hot water in a steady spiral that "stirs" the coffee. Seriously, check out all the steps. Roland Baker of Miami's Vice City Bean says the drink takes at least three to four minutes to make, even if the barista is hustling. On the plus side, good things come to those who wait... three to four minutes. Like delicious pour-over. Come on, we've been over this. Don't burden some poor sap sitting next to you just because you're too lazy to put your laptop into a bag and haul it into the bathroom. Besides, what if they have to go to the bathroom too? Who will watch the watcher's laptop?! It's a problem that can never be solved. "It's a pet peeve as a customer and a cafe owner," Carl tells us. "It's a tripping hazard in a shop with hot coffee." Also, if your laptop needs to be plugged in for you to keep working at the shop, you're probably one of those dang campers, anyway. Where do you plan on camping when the coffee shop runs out of money after being sued by people who've tripped on extension cords and spilled hot coffee on themselves? Repeat after us: Give the barista a tip no matter what you order. Even if it's just 50 cents! Don't try to tip 50 Cent though, he would probably get super mad. Carl tells us that a tip isn't just a thank you to the barista, it's a sign that you want the coffee shop to stay open. Remember: If the baristas don't get tipped enough, they'll find somewhere else to work. There's certainly plenty of coffee shops to work in. And if a shop doesn't have baristas… it won't survive. So if you love your local java joint, tip to make sure it stays there. You know where a great place is to take conference calls? Anywhere but a gosh darn coffee shop. "If you have to jump on a conference call, please take it outside if you can," Carl told us as politely as possible. "If you're the dominant audio source in the cafe, you shouldn't be. No one wants to hear your conversation." That is, unless your conference call is about your plans to buy everyone around you a free cup of coffee! Headphones are cheap (unless you're buying these). No one needs to hear the audio coming out of your laptop. So do everyone in the shop a favor and watch Paula Abdul and MC Skat Kat's classic video with headphones plugged in. We're just being straight up with you. We've all had an urgent need to go to the bathroom and no urge to go in our pants. And there's absolutely nothing wrong with ducking inside a coffee shop real quick to use the facilities. It also makes sense that you wouldn't want to buy a $4-$5 coffee just to use the bathroom. But remember to consider the fact that someone's going to have to clean the bathroom when you're done, and you just used paper towels, soap, and water that the coffee shop pays for. 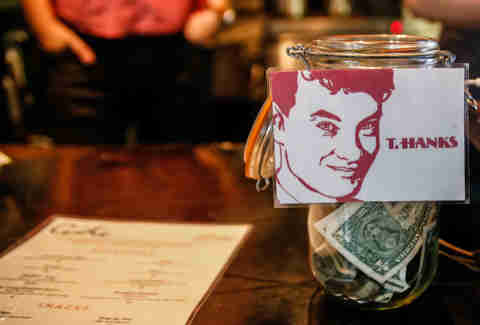 There's a simple solution: On your way out (hopefully after you've washed your hands), throw a buck in the tip jar. Plenty of specialty shops have communal seating in the form of long picnic tables where people with laptops can get work done while they drink a latte. For some reason, a portion of the coffee-drinking public thinks that if they're the first to sit down at the large table, the entire thing belongs to them. "Before some people get in line, they'll throw their backpack in the middle of one of our giant tables and spread out all their books," Steve, an anonymous barista at a hip coffee shop, says. 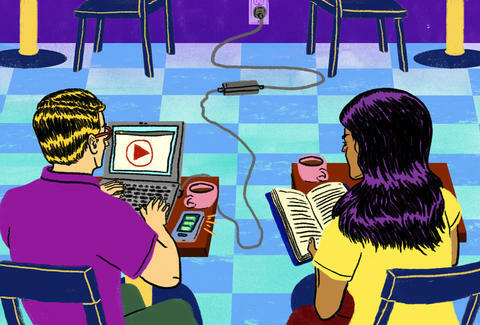 A coffee shop is not a university library, though if you do something this silly, you deserve to get schooled. It might seem like there are a lot of unspoken rules to being in a specialty coffee shop. But it's also a place to expand your coffee horizons and try something you've never had before. "Baristas are coffee professionals," Cronin says. "Ask them what they like! Try to be open to new things rather than ordering the same thing at every shop." Here's another tip: If they give you a drink you don't like, tell the barista. The worst that can happen is they tell you to shove off. They might even make you a new drink you do love. So strike up a convo with your barista next time you're in the shop. Lee Breslouer is a senior writer for Thrillist, and enjoys coffee quietly in coffee shops. Follow him to lattes @LeeBreslouer.